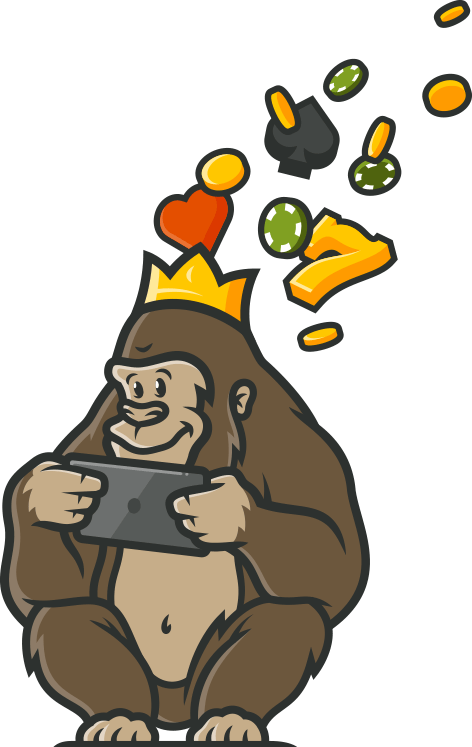 Get ready to enjoy the thrills of online gambling from home and stop monkeying around. 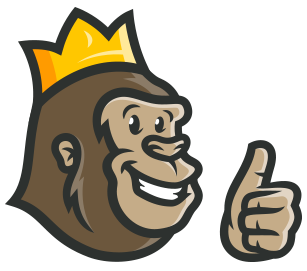 With the help of Casino Gorilla, players will see what the hype is all about and will surely go bananas over this established and trusted gambling site. As a new player at NYSpins, Casino Gorilla announces an amazing welcome bonus that can be redeemed when making the first five deposits to a new account. This bonus is a match offer that can provide players with as much as £1000 in free casino cash to enjoy on the games that are supported. It all starts with a 100% match on the first deposit, earning up to £100. In addition, 180 free spin will also be offered, playable for the next 9 days with 20 spins being offered each day. On the second deposit, one will enjoy another 100% match up to £300 and the third deposit will generate a 50% bonus for up to £300. The fourth deposit is also eligible for a 50% match bonus that can add another £300 to the account! Free spins are a great way to enjoy a large selection of games at NYSpins and as a new member, one will get 200 free spins including what is offered in the welcome package. The initial 20 spins will be awarded as soon as an account is created and these can be played on some of the hot titles at the site, including Joker Pro, Starburst or Wild Wild West. This is just one of the great offers that are presented that make players go ape over this great online casino. With these initial 20 free spins, players can win up to £100. Any bonus that is featured at the site will not require the use of a bonus code. Players can simply redeem the offer by accessing their account and visiting the Bonuses page at the online or mobile casino. There are strict terms and conditions that will apply to all bonuses offered at NYSpins. To claim the deposit and additional match bonuses, a deposit of at least £10 must be made to the account. When the free spins are added to the account, these can be played at wagers no higher than £5 per spin. The deposit match bonuses will be subject to a 45x wagering requirement based on the collected bonus amount. This requirement must be met before any bonus winnings can be removed from the account and players will have 7 days from the redemption of the bonus to meet the stated requirements. Players should note that they can only meet these requirements using funds that have been deposited. Placing wagers with bonus funds will not count towards any of the wagering requirements in place. NYspins makes use of multiple software providers to deliver a massive colection of virtual casino games. Here, players will enjoy titles from Microgaming, NetEnt, Betsoft, Nyx Interactive, Play’n GO, NextGen Gaming, Quickspin, Yggdrasil Gaming and Thunderkick. Featuring hundreds of slots, many video poker games and some classic card and table games, there is always something to enjoy at NYspins. Looking to hit it rich? Be sure to check out the great progressive games, such as Arabian Nights, Hall of Gods and Mega Moolah. Get ready to enjoy the most realistic games online with the offering of NetEnt live dealer games. With these, players can enjoy professional dealers, multiple betting options and will be able to interact with every player at the table. There are 11 live dealer options presented at the NYSpin Casino and these include variations of blackjack and roulette. Live dealer games can only be played for real money, so a funded account is required. Like to play on the go? With the mobile platform players can play anywhere, even from the treetops. There is no app required and no download. The mobile casino is completely browser-based, offering access to those with any device, including iOS and Android. The mobile site offers the same great games as the main online casino and these have all been optimized to run smoothly and provide a great visual appeal on smartphones and tablets. The real world may be a jungle, but at NYSpins, players are always safe when they conduct transactions to their account. This casino supports only the most trusted methods of payment and all transactions will be securely processed using encryption software. Making a deposit is fast and simple and is done by visiting the casino cashier, where one can choose from a variety of methods. Deposits can be conducted using MasterCard, Neteller, iDEAL, Euteller, Visa, Skrill, Turstly, Zimpler or EnterCash. Deposits will be immediately credited to the casino account and there are no fees that are incurred. The actual methods may vary based on where players reside and what payment methods are supported in their country. In terms of withdrawals, these are also secure transactions and NYSpins aims to provide fast removal of funds from an account. Withdrawals can be made using Neteller, Visa, MasterCard, Euteller, Trustly, Skrill or EnterCash and there is a 5 day pending time on all transactions It can then take 0 to 24 hours for funds to appear in an ewallet account and 2 to 4 days to appear on credit and debit cards. The casino does have a withdrawal limit of £100,000 per month in place. There may be no laws in the jungle, but Casino Gorilla ensures players they will be safe and secure when they play at the NYSpins Casino. This site is licensed and regulated by the Malta Gaming Authority and the UK Gambling Commission and always adheres to local gambling laws. Players will also know their sensitive data will be stored on a secure server and that the casino will never sell or trade any of this information. In regards to the fairness of games provided, the casino performs routine audits on all titles. This ensures the proper functioning of the RNG and also verifies the payout rates of each game, offering fair and equal chances for every player to generate payouts. There is no reason for players to pound their chest if they have problems when accessing the site. Here, there are professional support agents that an assist with any issue, whether that be regarding games, bonuses, accounts or any other services provided. The casino offers a great live chat option, which will be available 24 hours a day every other week. On the off week, support will be available from 8 am to 2 pm CET. Alternatively, there is also email support, which is always available. Australia, Bahrain, Belgium, Bulgaria, Curaçao, China, Cuba, Czech Republic, Denmark, Estonia, France, Hungary, Indonesia, Iran, Iraq, Ireland, Israel, Libya, Malaysia, Morocco, Pakistan, Poland, Portugal, Romania, Saudi Arabia, Singapore, Slovakia, Slovenia, Spain, Taiwan, Tunisia, Turkey, United States, Italy. For a full list of restricted countries, visit the casino’s “Terms and Conditions” page. Players won’t be collecting bunches of bananas at this site. With the stunning welcome bonus for up to £1000 and 200 free spins and the verified payouts from the hundreds of games offered, each and every member is bound to have a safe and rewarding experience that will make them feel as if they rule the jungle. This is just a typical online casino. Nothing that is super special here, but there are many games to play. I contacted the support team about the welcome bonus and they offered helpful information, though I never claimed the offer. Their game selection is quite good and the level of professionalism was very nice. The withdrawals were easy, the one negative I can think of is that there is no support for PayPal. Which is a glaring omission in my opinion in this day and age.